If I am correct, there are now three books of Fabio Venzi available in English. The first book was a collection of essays called The Influence Of Neoplatonic Thought On Freemasonry, which I can only find for a preposterous price of $ 368,29. Then we have the previously reviewed Studies On Traditional Freemasonry and this one. The last two are available from Lewis Masonic. In spite of the title, the present book does not have a whole lot of information about Freemasonry. Rather, it is a contemporary Traditionalistic book with some references to Freemasonry. The author starts with an introduction to Traditionalism and speaks about some of its best-known exponents. Interesting in this part is that he comments on some of the ideas of people such as Guénon, Evola and Coomaraswamy. Later on some ‘less likely Traditionalists’ are spoken about, such as Carl Gustav Jung of whom Venzi seems to be quite fond. Jung gets many pages which do not really interest me. Just as in the previous book that I reviewed, there are other parts which I fail to see the significance of. Largely, the book is interesting though and Venzi again proves to have some interesting and thought-provoking ideas. He also has a couple of interesting views on Masonic symbolism. 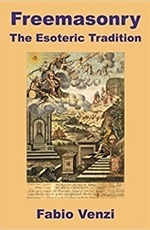 I enjoyed Studies… more, but The Esoteric Tradition again makes a nice read, especially because it is a contemporary Traditionalistic work which also dares to thread other paths than the usual.